Employee Engagement is viewed always an isolated activity. Different people have different perception about Employee Engagement. To elaborate this I would like to refer the six blind men and elephant story.. There were six blind men in a village. One day the villagers told them, "Hey, there is an elephant in the village today." They had no idea what an elephant is. They decided, "Even though we would not be able to see it, let us go and feel it anyway." All of them went where the elephant was. Every one of them touched the elephant. "Oh, how big elephant is? The elephant is a pillar," said the first man who touched his leg. They began to argue about the elephant and every one of them insisted that he was right. It looked like they were getting agitated. One wise man saw their argument. He asked them, "What is the matter?" They said, "We cannot agree to what the elephant is like." Each one of them told what he thought the elephant was like. The wise man calmly explained to them, "All of you are right. The reason every one of you is telling it differently because each one of you touched the different part of the elephant. So, actually the elephant has all those features what you all said." Employee Engagement is viewed like the Elephant described in the story. 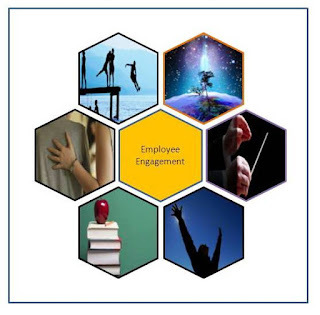 How they view Employee Engagement? Employee Engagement is keeping employees engaged by fun activities and some companies have “Chief Fun Officer.” They do all fun activities in the organization and try to engage employees(?). They celebrate birthdays, fun activities, different days and so on. Still these companies have attrition. Employee Engagement means organizing events for employees. Somebody view Employee Engagement means introducing some rewards schemes and giving certificates and cards. Some organizations go at home of employees on certain occasions. Some organizations try to get the involvement of families in certain activities. And still, employees are not engaged…. Companies celebrate birthdays, but ignore how the manager is treating to employees. They organize fun activities, but ignore the feedback on the performance of an employee. Managers view it as HR job and HR just see towards it as one of the KPI. The problem is all these activities are viewed as events and not the process. We forget that these are lag activities. HR professionals themselves view Employee Engagement as just organizing some activities and events for employees.